I know this sounds like kind of a strange sandwich, and it probably is, but stick with me on this one. Despite being a national chain, Boston Market has my favorite creamed spinach around. I’m not sure how they do it, but it’s just really good. It’s not too cream-y, not too spinach-y and it just tastes good. We somehow had some leftover at my house the other day, and I really wanted to eat some of it for lunch, but I didn’t want to just sit there eating creamed spinach because that wouldn’t be a very satisfying lunch. So I decided to make a sandwich out of it. And it was really good! You can use whatever creamed spinach you like, it doesn’t have to be Boston Market, but I can’t guarantee it will work as well (additionally, if you want to use fresh spinach leaves instead that’d probably work too. I’d recommend using baby spinach leaves though). Butter the outsides of your bread slices. Place first piece butter side down on the pan. 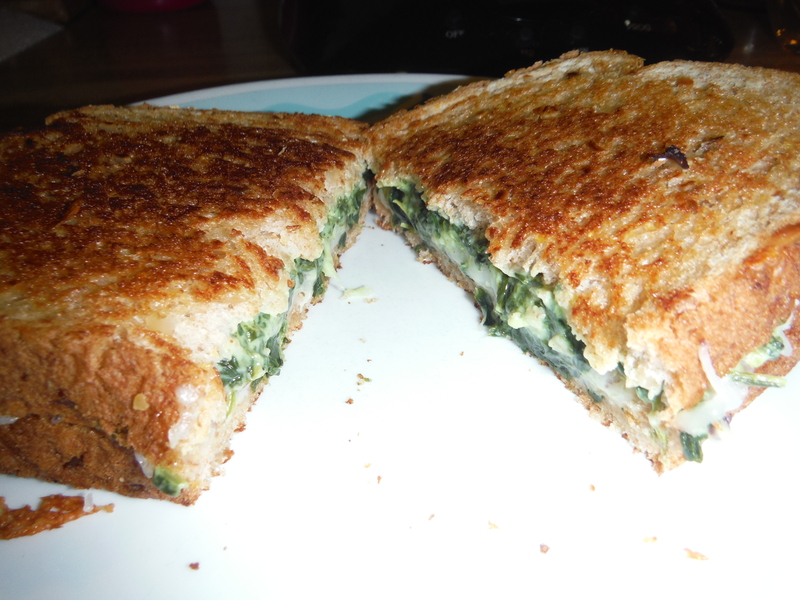 Spread the creamed spinach on top of the bread. Sprinkle the cheese on top of that. Top with the second slice of bread, butter side up. Cook until the cheese begins to melt. Flip, and cook until second side is toasty brown. Remove from pan, let cool slightly, then eat and enjoy! Posted on August 27, 2014, in Etcetera and tagged cheese, easy, grilled cheese, It's a winning combination, leftovers, Never judge a book, recipes, sandwich, vegetarian, yummy. Bookmark the permalink. 1 Comment.